Cool Edit Pro is one of the most highly capable multi-trackers/wave editors in the industry. There are a ton of new features compared to the previous release (1.3) that deal with MIDI syncs, AVI soundtrack editing and MP3 encoding. However, in this article I will only deal with the wave editing and multi-tracking abilities of this gargantuan tool. 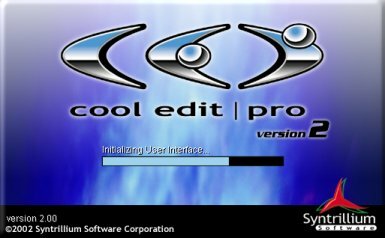 First and foremost I want to say that Cool Edit has always been my favorite wave editing/multi-tracking tool since I first bought Cool Edit 96 for $50. Although CEP 2.0 is cheaper than the 1.x series ($250 retail), I can't afford a retail version at this time so I'm using a time-limited evaluation version (21 days). From here on out I will refer to Cool Edit Pro as CEP. Syntrillium makes CEP. When I say the word "session" I am actually referring to a multi-track project. You can think of it as your "song." Cool Edit Pro is designed to run on Windows XP, but it seems to run on Windows 98SE just fine. This article was added to our database on July 19, 2002, and the article's information was last updated 16 years ago. efesar is responsible for keeping this article's information up to date. This page has been viewed 18941 time(s). © copyright 1993-2007 by fearstudios.com ( 186203904+113ms ). All Rights Reserved. Report a bug or make a suggestion.